Traveling Native is inspired by life in rural Tuscany where Andee has lived and worked since 1997. 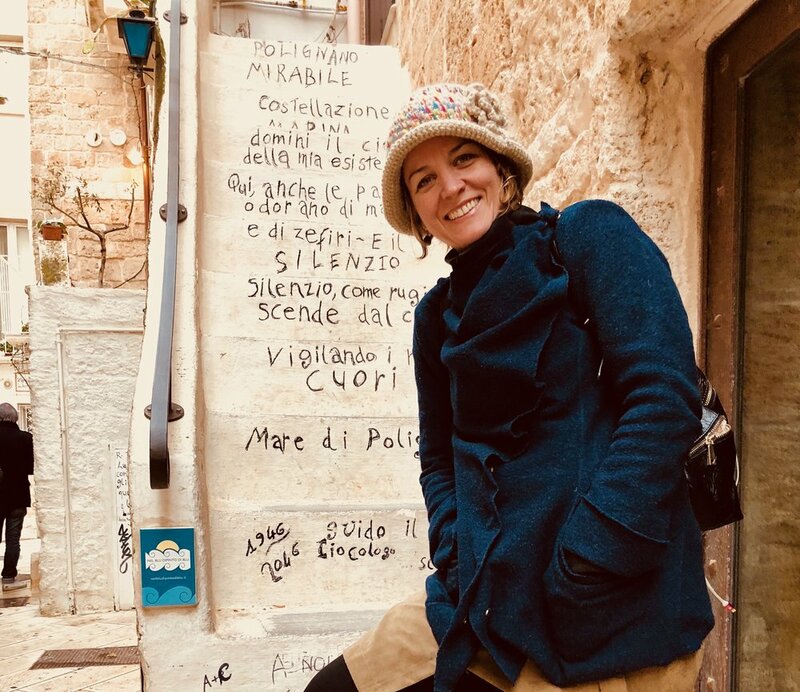 Her long-time love affair with Italy began with the trials of becoming part of the scenery and finding herself at home in the Italian language. Never landing as a tourist, her approach was always to generate a sense of real belonging. The long haul of invigorating and many times uncomfortable work to make a home away from home, eventually took root and evolved in gratitude toward the mission of Traveling Native: to sustain the art of enjoyment of the very less-published landscape that opened the door and welcomed her in. It turns out, being in Italy with Andee is much like coming home to find new friends around the table. The novelty of each encounter and every meal shared is accompanied by the warmth of Andee’s kinship with the people, the food, the landscape. Each experience is carefully designed to connect you to what is truly exceptional about Italian living: The Art of Enjoyment. This Tuscan cook is esteemed by his peers and cherished by his customers and students for balancing tradition and elegance in every aspect of his work. He is chef and owner of one of Italy's most celebrated restaurants and historic places, L'Antica Locanda di Sesto. Aurelio is making a name for himself as a teacher and a consultant in the U.S. Traveling Native enjoys the fortune of his collaboration and direction on culinary tours in Italy and workshops in the U.S.
Andrea and Marzio, our Tuscan Drivers. Panzano in Chianti. Arcadia University Preview 2014. Tuscan Driver's is a father and son operation. Andrea and Marzio are natives of the Valle del Serchio and Garfagnana. They provide friendly private transport for Traveling Native in Italy. Andrea Paganelli organizes excursions to many destinations in Italy. He is currently earning his title as Sommelier and specializes in wine tasting excursions. Emanuele is a Florentine-blooded restauranteur in Siena. He is he founder and former owner of Pretto Prosciutteria, a thriving eatery in the heart of the medieval city that is famous for il Palio. Located just steps from Piazza del Campo, Pretto quickly became a mecca for the genuine flavors of The Chianti region. Emanuele is a goldmine of knowledge for travelers in Tuscany's most renowned wine region. His approach to exploring his native terroir is based on a deep appreciation for the close-knit community of farmers, butchers, growers, and winemakers whose heartfelt work respects the environment, the prime provider of culinary enjoyment. Stephanie is a Traveling Native in heart and mind with a lust for beauty and art. Though she has lived most of her life either on the road or abroad - first as a musician and then as an teacher living in Lucca, Italy, she emits a keen sense of home. As a writer, she gathers all of her gifts and experiences together and what we get is a holistic and transformative experience. If the physical act of travel is out of your reach, take a walk with Stephanie's words. Her writing wakes you with new views of familiar spaces. Her stories give you a place to marvel, reflect and unfold. You can enjoy her work on her blog, download it on amazon, and on special occasions, visit with her here on Traveling Native's Blog.